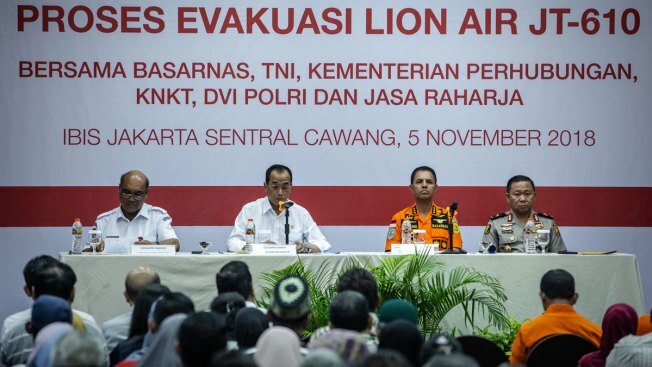 Families of victims of Lion Air flight JT 610 attend a meeting with authorities and Lion Air management on Monday, Nov. 5, 2018, in Jakarta, Indonesia. Indonesian officials said they have downloaded the data from a black box recorder for the flight, which crashed into the Java Sea last week, while more than 100 body bags containing parts of passengers have been handed to the national police hospital in Jakarta for identification. The "black box" data recorder from a crashed Lion Air jet shows its airspeed indicator malfunctioned on its last four flights, investigators in Indonesia said Monday, just hours after distraught relatives of victims confronted the airline's co-founder at a meeting organized by officials. National Transportation Safety Committee chairman Soerjanto Tjahjono said the problem was similar on each of the four flights, including the fatal flight on Oct. 29 in which the plane plunged into the Java Sea minutes after taking off from Jakarta, killing all 189 people on board. "Data from the black box showed that two flights before Denpasar-Jakarta also experienced the same problem," he said. "In the black box there were four flights that experienced problems with the airspeed indicator." Indonesian investigators, the plane's manufacturer, Boeing, and the U.S. National Transportation Safety Board are formulating a more specific inspection for Boeing 737 MAX 8 planes related to the airspeed problem, Tjahjono said. "I want Mr. Rusdi Kirana and his team to pay attention," he said. "Since the time of the crisis, I was never contacted by Lion Air. We lost our child, but there was no empathy that Lion Air showed to us." Relatives questioned why the plane had been cleared to fly after suffering problems on its Bali to Jakarta flight on Oct. 28 that included a rapid descent after takeoff that terrified passengers. "Lion Air said the problem was fixed, is it true the problem was cleared?" asked Bambang Sukandar, whose son was on the flight. "If not, technicians in charge must be responsible," he said. "The law is absolute, because they have stated that the plane was cleared to take off again. These bad technicians must be processed by law to prevent plane accidents from continuing in Indonesia."